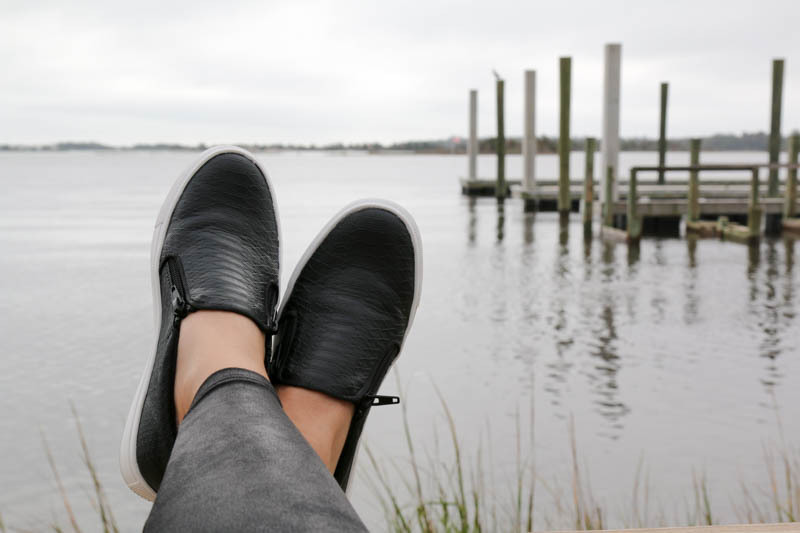 Famous Footwear’s Ammons Slip on Sneaker is exactly what I threw on for a day of exploring in downtown Swansboro with my husband while we window shopped for Christmas & enjoyed the water views. I love the double zippers on the sneakers, & the croco print is so chic! I couldn’t have slipped on a better pair of shoes to be on my feet for hours. They’re just as cute as they are comfortable. Perfect with leggings, jeans, or even a casual dress, these slip ons will be your go to! There are tons of different styles that Famous Footwear offers for any shoe lover. Do yourself a favor before the hustle & bustle of the holiday season really hits & make your life a little easier by snagging a pair of slip on’s for yourself. Better yet…get some for a gift too (two birds, one stone!). Who doesn’t love a comfortable & fashionable pair of shoes?! Plus, you’ll love the inexpensive prices. Head to www.famousfootwear.com for all your shoe shopping needs, & cheers to happy feet!